« Go To Macworld 2007 FREE! It’s no secret that High Definition televisions and programming are becoming increasingly abundant. Flat-screen TVs are at all time low prices, which makes HD obtainable for just about everyone. One large issue remains, getting the HD into the home. We have all heard of HD DVD and Blu-Ray, and I am sure that we have all seen the prices. Still way out of reach for most consumers. And who wants to buy a format that is not yet a standard. In the meantime, prime-Time television is almost all HD, with the exception of a few shows and most reality based programing. But the problem remains, who do we get HD into the home? Several reports claim that only 40-50% of consumers who own a HD capable TV actually watch HD on it. For the tech savvy consumer, there are countless products on the market to help get HD home. And hopefully this will be the year when the average person can get the HD experience. More products and solutions are coming out that should make this transition possible. Most populated areas now have “Off-Air” HD available. This means that with a proper antenna and a ATSC tuner the consumer can get “Over-the-Air” HD. While cable or satellite service offers some better options as far as programing goes, the quality is identical in most cases. Remember with digital TV, you either have the signal or you don’t. For the average person a DVR or PVR from TiVo or your television service provider is a really great upgrade. The problem is, that it is expensive, especially when dealing with HD. This turns most consumers off, however, the experience is rather extraordinary. When one actually uses a HD DVR, they are usually hooked. Is there really any other way to watch TV? So regardless of your current HD status, it really worth the upgrade it you watch TV at all. And if you are already into HD, and the Mac, there is a good product that you have to by. 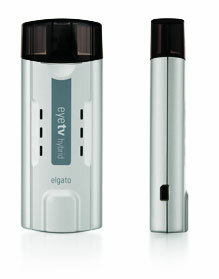 It is the eyetv hybrid from Elgato. It is a Analog and Digital TV receiver for your Mac. It is really cool! The eyetv hybrid comes with a hardware receiver (you will need to attach an antenna) and the eyetv software that basically turns your Mac into a HD DVR. You can program recordings and the software will automatically convert the shows for your iPod if you want to watch them there. The HD recordings are in the MPEG-2 TS ATSC format, so there no quality loss. This is a much more cost effective solution than a TiVo series 3. While it is not going to replace my Comcast DVRs, I will use it from time to time for various purposes. I truly think that this is a wonderful solution for the Mac. It will be interesting to see what happens when Apple releases it’s iTV. But these are the product that will make HD TV get into the home.